Morocco - the final (pink) day! Our last day in the field was one our Ore Curator, Helena Toman, was particulary looking forward to. We had finished visiting the fossil sites and today we would spend having a look around an active mine and collecting samples for the Museum's collections. Before we delve into the world of ores, it’s probably best to clarify what an ore actually is! 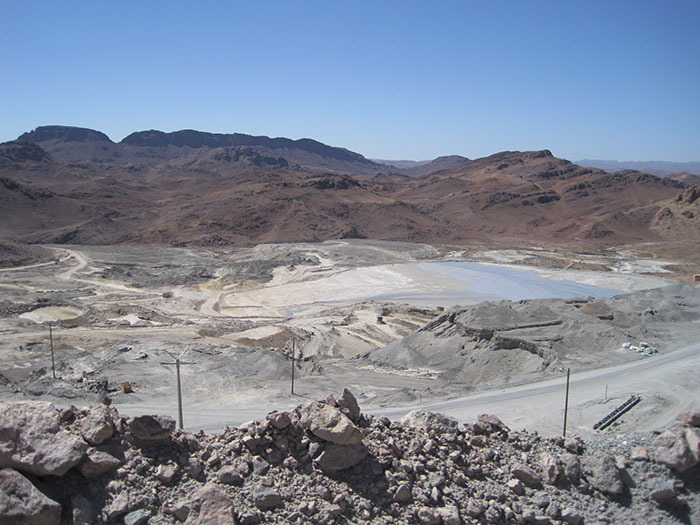 An ore is any naturally-occurring mineral or assemblage of minerals from which economically important constituents, particularly metals, can be extracted. The field of economic geology focuses on ore deposit formation, ore mineral exploration and the successful extraction and processing of an ore. I like to think of economic geology as occupying one of those crucial interfaces between science and society and so one of the challenges as the Ore Collections Curator is to make the science accessible to society. Over the past couple of months, you’ve taken part in our adventure to the geological treasure trove that is Morocco. After sieving for Cretaceous sharks teeth; excavating extinct volcanoes for mantle xenoliths and exploring for minerals we reach the final field stop of this incredible journey, the cobalt-nickel arsenide ore bodies of Bou-Azzer. 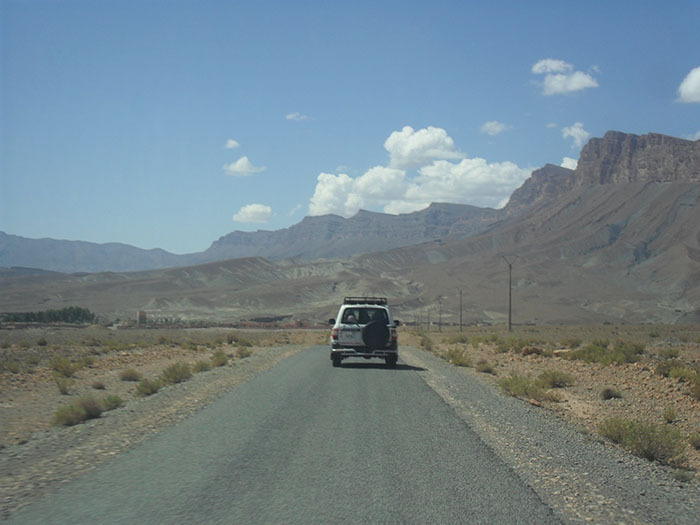 On the road into Bou-Azzer mine. 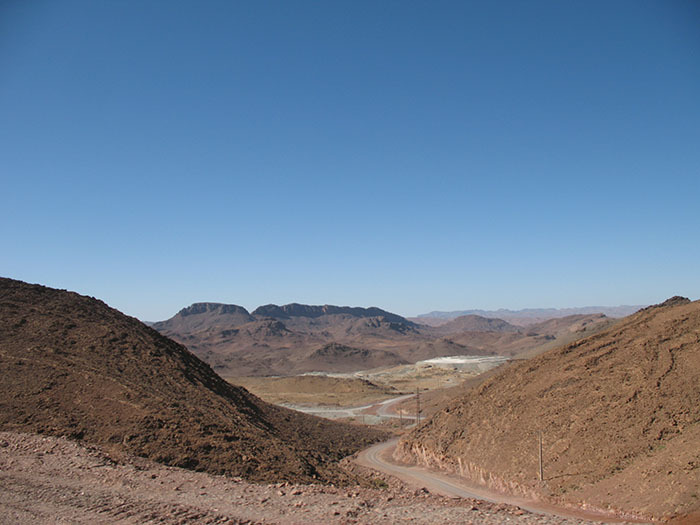 Located in the central Anti-Atlas Mountain range within a very old (788 ± 9 Ma, Gahlan et al., 2006) ophiolite – a section of the ancient sea floor that has been obducted onto land - Bou-Azzer is presently the only mining district in the world to produce cobalt as a primary commodity from arsenide ores (USGS, 2011). 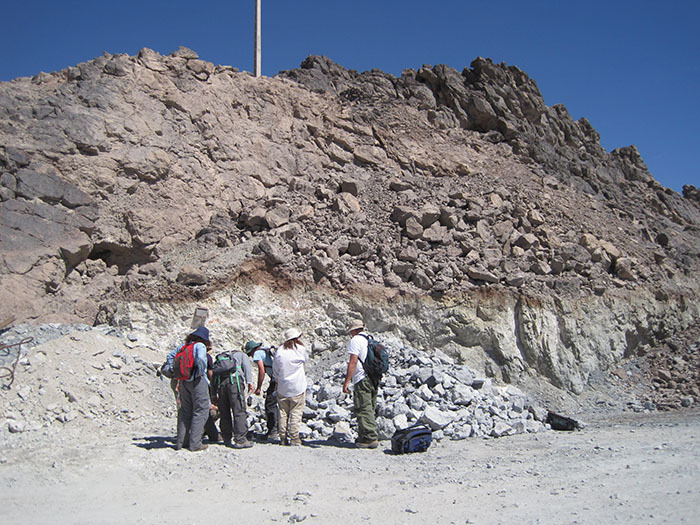 As cobalt is usually extracted as a by-product, mineralisation at Bou-Azzer is unusual and therefore scientifically interesting. Put bluntly, we’d be mad not to visit and collect! One thing that you can safely predict is that most mining operations are located in very remote and difficult-to-access locations. Bou-Azzer is no exception. After a long, bumpy, but visually stunning car ride we were warmly welcomed by mine employees who introduced the group to the geology and mining history of the district. Then, after a much needed sugary mint tea, the moment had arrived. The moment I had been waiting for – access to the ore pile! We drove up. The midday sun beat down on the mass pile of rocks before us. Looking through the discarded material next to the mine. Dull silvers highlighted the primary cobalt mineralisation of Bou-Azzer: skutterudite (CoAs3­); safflorite (CoAs2); loellingite (FeAs2­); nickeline (NiAs) and rammelsbergite (NiAs2) while pale pinks and rich purples drew attention to the secondary mineral, erythrite (Co3[AsO4]2.8H2O) (Ahmed et al., 2009). I have to admit, as ores go, they rarely get ‘prettier’. 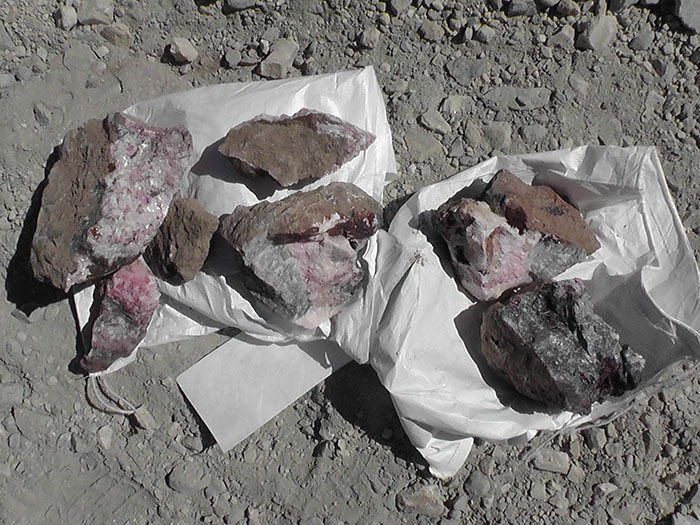 Some of the samples we collected at the mine. While I could have stayed for days, our schedule was very tight and it wasn’t long before we needed to leave; it really was a case of ‘all hands on deck!’ Decision making (often against the clock) is part of a curator’s in-field skill set, so only samples that best provided an understanding of the mineralogy, mineral assemblages, mineral textures and mineralisation styles present at Bou-Azzer, made it into the suite. As someone whose scientific interest area is economic geology, visiting Bou-Azzer was the cherry on top of the cake – or, as we are dealing with all things Moroccan, the mint in my tea. Describe the fieldtrip in one word? Ore-some. If you would like to find out more about ores, the Museum ore collection and our research, please see our ores group webpages, or you can follow up with the references below. Thank you to Helena for telling us more about the ores and what we collected. 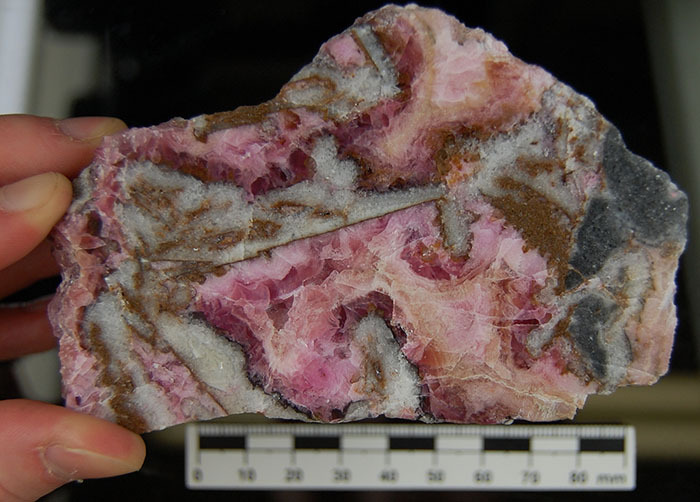 I was particularly excited about going to the mine as we were trying to find some pink minerals, and pink is my favourite colour. Some of the specimens looked wonderful sparkling in the sun and it was great that we were able to collect so many new samples for the ore collections. I thoroughly enjoyed my time in Morocco, seeing something new every day and you can learn so much more in the field than reading a book or paper about the area. For me, it was great to learn from the mineralogists on the trip and find out more about what they do and also learn from more senior members of staff (I think we all enjoyed learning from each other and getting to know each other better). Being able to visit sites I have heard so much about such as the Kem Kem and Goulmima was fantastic. And knowing that finding the fossils (and mineral specimens) during our trip helped to enhance the Museum collections is a great feeling. I am hoping to return to Morocco later in the year to present some results at a conference of specimens we collected during our trip. Ahmad, A.H., Arai, Shoji, and Ikenne, Moha, 2009, Mineralogy and paragenesis of the Co-Ni arsenide ores of Bou Azzer, Anti-Atlas, Morocco: Economic Geology, v. 104, no. 2, March–April, p. 249–266. USGS, 2011, Minerals Yearbook: Morocco and Western Sahara (Advanced Release), p. 30.1 – 30.9. 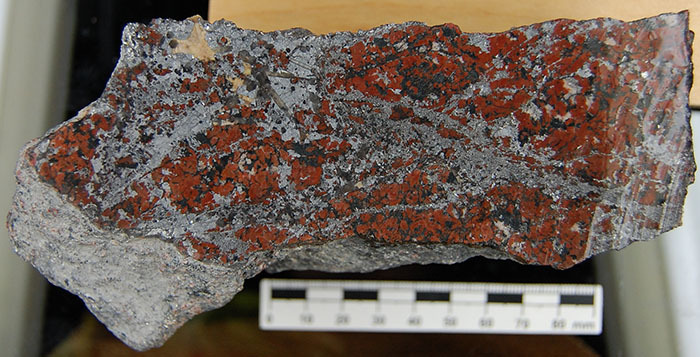 Gahlan, H., Arai, S., Ahmed, A.H., Ishida, Y., Abdel-Aziz, Y.M., and Rahimi, A., 2006, Origin of magnetite veins in serpentinite from the Late Proterozoic Bou-Azzer ophiolite, Anti-Atlas, Morocco: An implication for mobility of iron during serpentinization: Journal of African Earth Sciences, v. 46, p.318–330. 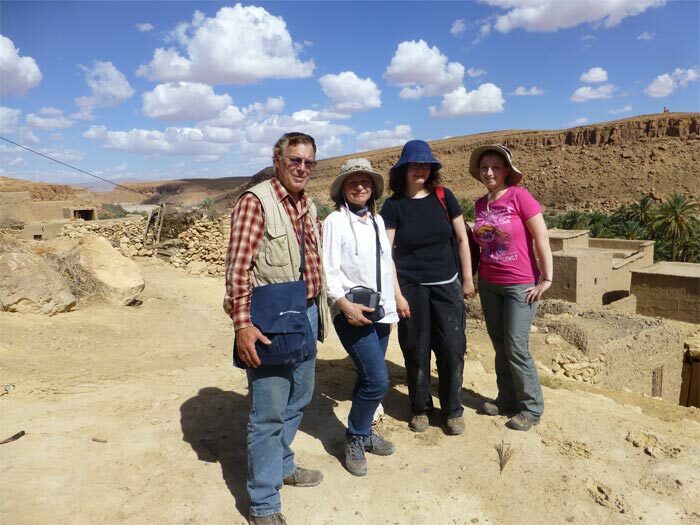 It has been a while since I last posted about our Moroccan adventure last year, (please excuse me) I've been rather busy in the collections and hosting students and researchers. I will bring you up to speed with some of that in later blogs! Back to Morocco! We had been in Morocco for several days now and were loving every minute of it. Myself and Zoe will both be blogging about our trip to Goulmima as we both had strong interests in the area and the fauna. See Zoe's blog for her view of the day! The day started off by looking around a fossil and mineral shop/museum which was attached to the hotel where we were staying. They had lots of great things and some great casts, if only I had enough room at home to have a Triceratops skull in my living room! Some fish from Morocco available to buy in the fossil shop. After we had left the museum we were on the road again. Everyday we were travelling to different localities and seeing something new. It was great to see so much of the Moroccan landscape, it was amazing. 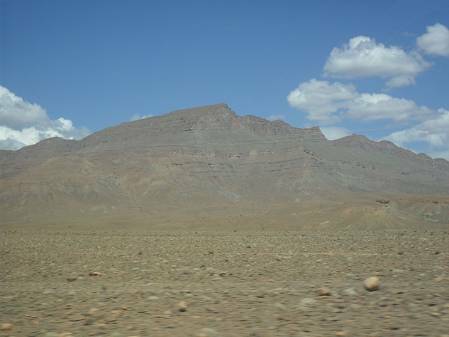 The geology and landscapes which we were driving through changed everyday. Myself and Zoe ready for the day ahead! Just one of the many pictures I have of the Moroccan landscape. 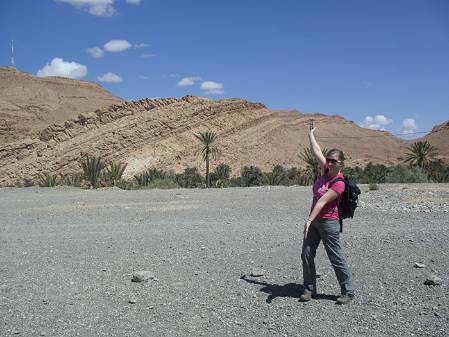 Zoe was definitely the most excited about the trip to Goulmima as you get lovely ammonites from there. 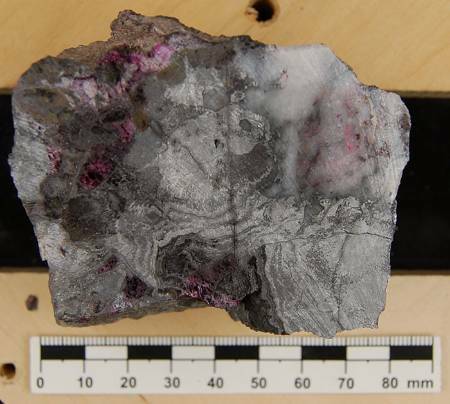 I was also interested in going there as amongst the ammonites you get fish in calcareous nodules and I knew we had nothing from that area in the collections so I was intrigued to find out more about the site and what we could find. We stopped at a few sites on our drive but we didn't find any vertebrate material. Our team found some invertebrate material, bits of shells and ammonites, so after a while we moved onto another site. Me at the Asfla 1 site. It was a steep climb to the top of the hill behind me! The next site, Asfla 2, proved to be more fruitful. We discovered partial pieces of ammonite and Plesiosaur bones, but still no fish. Althought they were only scrappy bits of Plesiosaur we still collected them as they will be useful in the handling collections and in the Angela Marmont Centre (where you can bring fossils to have them identified) in the Museum. Mark at Asfla 2 site, trying to sniff out some Plesiosaurs! Our last stop was a village settlement where most of the residents make a living out of fossil hunting, particularly from Goulmima. The rocks here are Cretaceous in age - about 90 million years old. Here were were taken by our local guide and shown some amazing specimens. 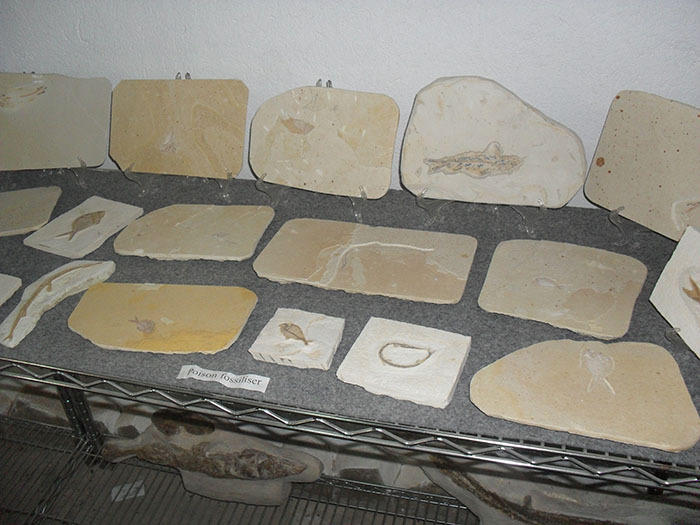 What particularly caught the eye of TEAM FISH were the famous fish in nodules to be found in Goulmima! These fish are called Goulmimichthys and are part of the class of fish commonly known as ray-finned fish (you can still find ray-finned fish swimming in the seas today e.g. cod). These fish are elongate and had numerous small spiny teeth. Some of the specimens we saw even had some soft tissue preservation, which is amazing. It is very rare you get soft tissue (muscles, skin etc.) fossilised, as it is usually eaten by predators or rots away very quickly after the animal dies. Goulmimichthys looks very similar to fish (Rhacolepis in particular) that are found in the Santana Formation in Brazil. There has not been a huge amount of research done on Goulmimichthys and because we do not have any fish material from that area in Morocco in the collection we decided to purchase all of the specimens that` you can see in the picture below. The other flatter fish you can see are Ichthyodectes, which had a large mouth with pointed teeth. It was a fast swimming predator at this time. I am actually going to start doing a research project on these fish which I am quite excited about. We are going to have the specimens CT scanned. This is a powerful machine which allows us to look inside the nodules (similar to an x-ray) instead of cutting the nodules (and the fossil) in half. I have not done this before so I am looking forward to learning new skills. Hopefully by doing this we can better understand how Goulmimichthys relates to other fish like Rhacolepis from Brazil. TEAM FISH: David Ward, Martha Richter, Zerina Johanson and myself. 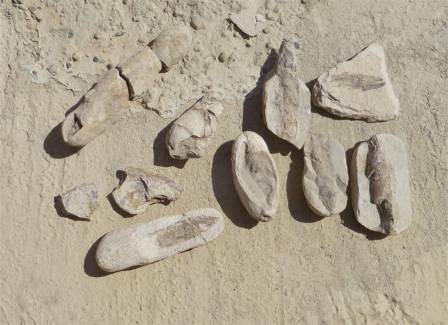 Fossil fish mostly in nodules collected from Goulmima. This picture does not do them justice, they are more beautiful when you see them for real! We did very well visiting the local collectors and seeing what they had. 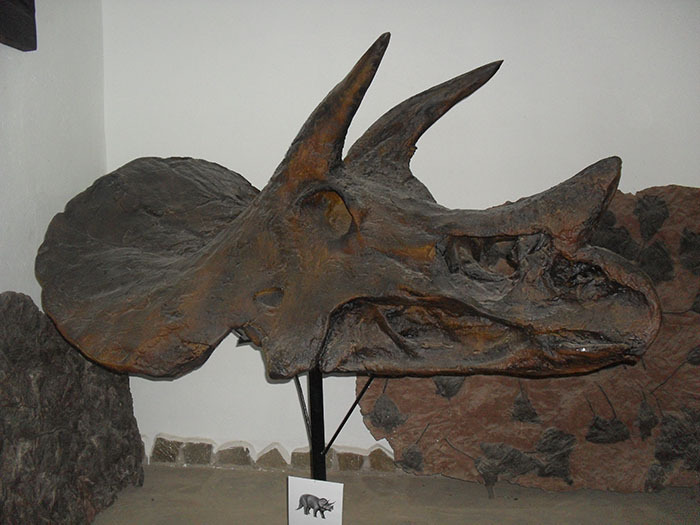 We gained many new specimens for the Museum's collections and made some good contacts with the local collectors. From here we headed to our next hotel and packaged up our specimens to be shipped back to the UK. My next blog about Morocco will be a guest one from our ore curator who was with us talking about pretty pink minerals! 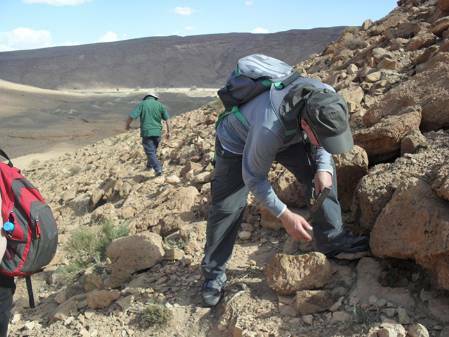 Joe on Earth Science Field trip to Morocco - Day 1 Sun, tagines and thousands of sharks! Kem Kem - dinosaur heaven! Morocco Day 2: Volcanos, monkeys and more sharks! Earth Science Field trip to Morocco - Day 1 Sun, tagines and thousands of sharks!